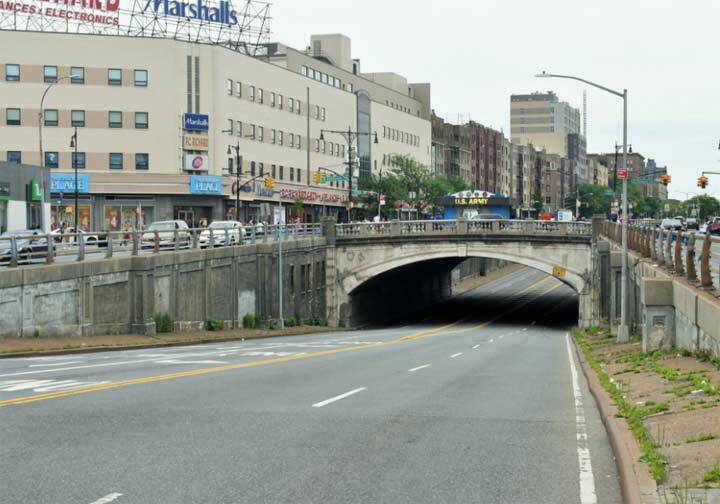 Eleven lanes wide from 161st Street north to Mosholu, the Grand Boulevard and Concourse (shortened to Grand Concourse for the benefit of sign makers and cabbies) was conceived by engineer Louis Risse in 1870 and was built, from 161st Street north, in 1909. 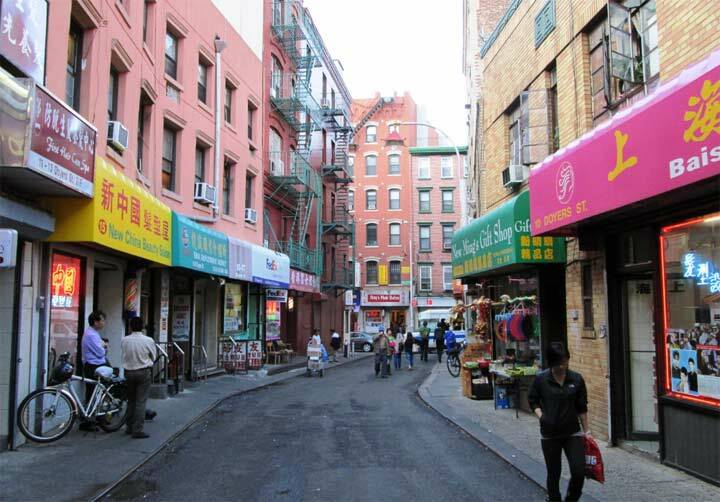 In 1927, it absorbed Mott Avenue, which ran from 138th north to 161st, and the older street was widened. The Grand Concourse became the Bronx’s showpiece as the Bronx Borough Hall, Yankee Stadium, and an array of elegant apartment buildings were constructed along its length. 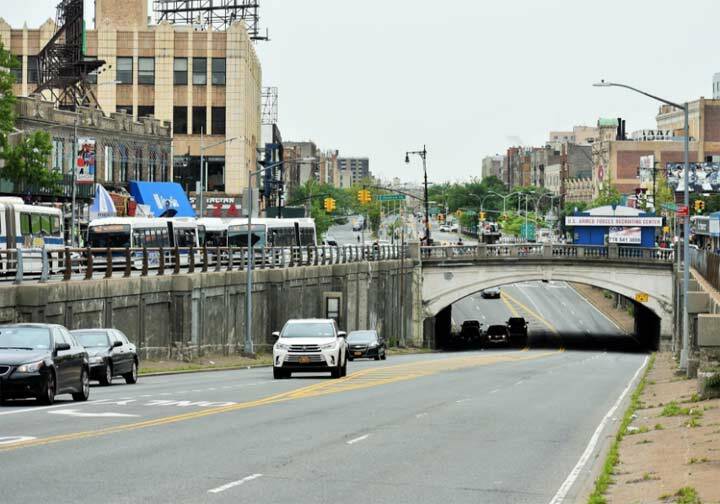 Unless you are a motorist using the GC frequently you are probably unaware that East Fordham Road is bridged over it in an arch structure probably going back to the GC’s origins in 1909. The central four lanes bypass the busy intersection completely. In other intersections, lanes of Kingsbridge Road and East 204th, among others, pass under the Concourse, but this is the only case in which a road is bridged over it. Here, at left, we see the former Alexander’s Department Store, the flagship in a chain of stores founded by George Farkas in 1928 and named for his deceased father. The Fordham Road store opened in 1933 and closed in 1992. The building is home to electronics chain P.C. Richard and clothing retailer Marshall’s. Looking south toward the Fordham Road Bridge. At left here is the Wagner Building, which on November 5, 1960 was the site of a campaign speech by John F. Kennedy, a few days before he beat Richard Nixon. As a boy in the 1920s, Kennedy had resided in a mansion with his family at Independence Avenue and West 232nd Street in Riverdale. I know the area well from my college days at the nearby NYU Uptown Campus (50 years ago! ), now Bronx Community College. There was a large kosher deli called Mother’s Grand at the NE corner of the Concourse and 188th Street, at the top of the subway stairs. It’s been closed for many years as the area demographics changed completely in the 1970s. Not visible, unfortunately, on the upper photo (to the right or northeast) would be the Dollar Savings Bank building, which I think in its time was one of the tallest buildings in the borough. The banking floor was huge and had a very high ceiling. Back in the day of savings books, you would line up behind the teller’s window corresponding to your last name because of the banks records were on paper and had to be pulled up by hand. Poe Park and cottage are on the next block north. By the way, I can’t count the hours of time lost having to stand in line time and again to return my mother’s purchases on the top floor of Alexanders.